In his exhibition at Gimpel Fils in 2000, Edwin Zwakman presented a series of photographs depicting the urban landscape. The facade of a block of flats, a kitchen table covered in the remnants of breakfast, a JCB digger hard at work in the area of urban renewal all familiar enough. But within these representations of real life there was a deception. In Zwakman's work reality is an illusion, as the landscapes depicted were in fact maquettes, carefully constructed from card, plastic and wood and made in the studio. Once this illusion had been discovered, Zwakman's photographs disorientated onlookers and subverted conceptions of truth. The new work presented in Fake but Accurate shows how Zwakman has taken his practice of model making a step further. Rather than try and hoodwink audiences into believing these images as depictions of reality, the nine back gardens illustrated are clearly simulations. Whereas previously audiences had to look for evidence of the miniature model in Zwakman's photographs, here the illusion is shattered from the start. With their hand made look, the backyards are clearly constructions. But yet the models are recognisable as gardens and as such, are just as the exhibition title suggests, fake but accurate. By removing a layer of disguise, Zwakman facilitates a probing enquiry into our utilisation of domestic space. His photographs lead us to consider the standardisation of the spaces in which we live and the social aspirations of owning not only your own house, but your own land too. The photographs are aerial shots, some include the rear facade of the terraced house and others include the space of the back alleyway. House and garden TV programmes tell us to think of the garden as another room in the house. So what are these outdoor rooms used for? There are clues: a barbeque, a washing line, a patch of lawn and ornamental pond. Some of the owners of these spaces are clearly garden proud, others not at all. Overgrown plants and a discarded fridge litter one backyard. Home is traditionally thought of as a place of safety, security and privacy. Home is a place where you can let your hair down and the garden is an extension of that private space. But in their proximity to one another, the squares of lawn and paving illustrated in these images point to the existence of neighbours. The fear of having to share the same space with one's neighbours gives these works what Zwakman calls a 'slightly claustrophobic' air. This air of foreboding is exacerbated when we notice the standardization of the garden shape and size. Even in their individuality they remain repetitions of each other, each garden an individual cell for the containment of a common domestic experience. Since January 2005 Edwin Zwakman has been the recipient of a Lever Hulme Fellowship at the University of Derby. This is his second solo exhibition at Gimpel Fils. Gimpel Fils is pleased to announce the second exhibition in its new contemporary art project space. 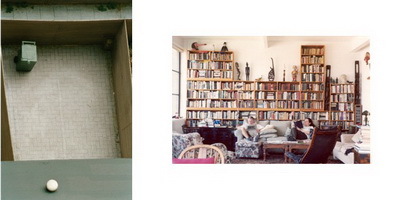 Dylan Stone's Barbara and David Stone's Bookshelf is both a monument and a monumental artwork. Comprising thirty-eight sheets of paper each measuring 22x30 inches, the work is a life-size watercolour study of an enormous bookshelf. Reproducing the spine of each book in intricate detail, Stone has documented a personal library that speaks of individual interests and fascinations. Moving from left to right the books are in more or less alphabetical order, most books stand vertically, but others lie horizontally, placed upon the tops of other books when space is in short supply. It is easy to become engrossed in the bookshelf, spotting books you have read, attracted by the luminosity of the watercolour, entranced by the balance of the mosaic of paintings. Barbara and David Stone's Bookshelf is an obsessive, dusty and romantic still life. It is a painting about how the things that surround us, intellectually affect the dynamics between people. Dylan Stone spent nearly two years painting Barbara and David Stone's Bookshelf, and in doing he has created a work that is conceptually engaged with the outside world, and also shows that he is his parents' son. As part of Gimpel Fils' continuing commitment to contemporary art, the Lower Gallery opened in November 2004 as a new space devoted to showcasing challenging and experimental artwork. The Lower Gallery has its own exhibition programme comprising solo shows by both emerging and established artists who have not previously exhibited at the gallery.